With temperatures hovering just under 100 degrees F since we returned from our vacation I have decided one thing about meal time: It is simply way too hot to cook right now. But that doesn’t mean I can’t prepare dinner for our family. We still have to eat something. Grilling is a great option during these hot months. It keeps the heat where it should be: outside. I was so inspired by all of the great grilling recipes shared here on Simple Bites over the past week and can’t wait to try some of them. I have never grilled with a cedar plank before. And after a recent trip to Greece, I’m dying to get my hands on some Haloumi so I can make Danny’s Grilled Peach and Haloumi Salad. But what do you do when it’s too hot to even go outside? Many times I’ve felt to the point of near heat exhaustion as I stood over a grill flipping meat and vegetables. That is when it’s time to break out the salads and other no-cook dinner recipes. Because popsicles and ice cream aren’t acceptable main dish choices on a regular basis. I love diving into a crisp, cool salad for dinner after a hot day. This Black Bean Salad is a staple around here during summer. It’s full of colorful vegetables, beans and flavor. But more importantly, it is versatile. On top of a bed of mixed greens for a simple, Mexican inspired salad. 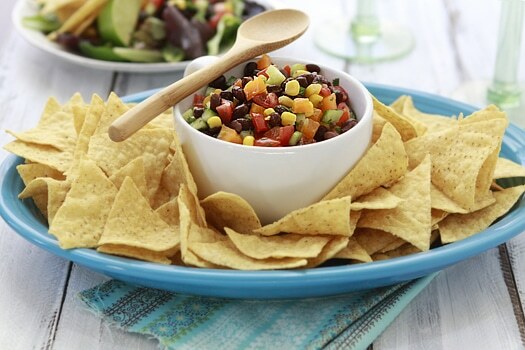 If you’re looking for a simple, no-cook option for the upcoming Fourth of July Festivities, this black bean salad will make a great addition to your party. Think of it as a healthier version of traditional chips and salsa. Combine the beans, bell pepper, tomato, corn, cucumber, green onion, jalapeno, and cilantro in a medium bowl. Stir until ingredients are well distributed. In another bowl, combine the lime juice, oil, cumin, coriander, salt and pepper. Pour over the bean mixture, tossing to combine. Chill until serving time. What do you serve on nights it’s too hot to cook? I love this salad. My sister in law makes one like it and it is always devoured at family gatherings. Thanks for the reminder. I think I’ll make it this summer too. My family just left Las Vegas after nine years. I understand “too hot to cook”. Salads are my go when it’s even too hot to step out onto the patio to grill! This sounds great, very quick and easy to put together. When it gets too hot to cook I pretty much survive on simple salads like this. This is right up my alley! Yum! This is one of my stepmom’s all-time favorite side dishes – I can’t ever make it without thinking of our family’s outdoor dinners in the summer. yay! Love, love, love black bean salad! I would add sliced avocado to the mix! Yum! Thanks for posting this. It looks delicious! Now if I could only find a chip recipe that doesn’t involve buying tortillas. I can make tortillas and bake them but they are pretty thick for chips. Anyone have a recipe? 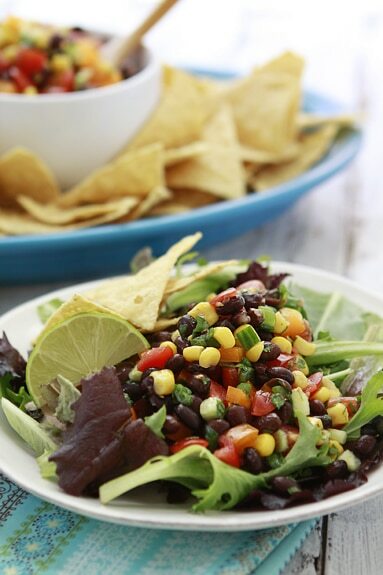 This black bean salad looks to die for, and great for a barbecue! Love this simple and wonderful summer salad recipe! On summer nights, I usually grill– chicken or fish and throw it into a salad. When it is too hot too cook I try to convince my husband that we should have ice cream for dinner! He usually won’t go for it so I end up making a salad and grilling some chicken! What a great refreshing Summer salad. Love it and your photos are amazing! I certainly know how you feel since the temperatures where I live are already in the 100s F but I don’t mind as long as there is some shade during the day and something cool to drink. In the summer I organize my days so that I cook anything that needs cooking straight after breakfast. Then I work until the kids come back home and then prepare the rest of the meal; so we tend to eat everything cold. Sometimes everyone craves hot food from the barbecue – but my husband does that! Love black beans and I love this salad! Summer perfection! What perfect timing! I was just coming over here to find a recipe for the weekend that was gluten free, dairy free, and had no cilantro, and what did I see right there on the front page as if it were written for me? Two out of three isn’t bad, and I can skip the cilantro! Getting together for a meal with my family and my sister’s future in-laws is quite tricky with all the allergies and sensitivites floating around. Thanks for saving me a lot of searching! Will defintely give it a try! I love that you can change it all around as well, to suit your tastes! I have never met a black bean salad I did not love. This one looks like I will absolutely adore it. I can just eat it straight out of the bowl. Don’t even need a chip. And on a hot summer day, I can think of nothing more delightful. thanks. This is a great idea. We love all these ingredients and it’s so simple. Very festive. I just love the simplicity of this recipe. And even better, I love that it gives you an excuse to eat tortillas for dinner! Don’t have to tell me twice! Black bean salad is one of my favorites during the summer, and your version looks perfect! I always make it with grilled veggies for quick and easy vegetarian fajitas. This looks good, and I don’t even like beans! When it is too hot to cook, I make pasta salad early in the day and refrigerate until it’s time for dinner. Boiling water for pasta doesn’t seem too terrible at 11:00 in the morning as opposed to 5:00 in the afternoon! I had a version of this in the rice cooker last night alongside some quinoa and for breakfast this morning in scrambled eggs. Neither of those are no-cook options, but it’s rainy and COLD here! Made it just as directed except I had to squeeze the plastic lime (didn’t have any fresh ones on hand) and I don’t eat jalapenos, so that was omitted. It was just what I needed… both last night as a side and today on salad. Thank you! I love this salsa, eat it all the time. The cumin gives it a fabulous taste. It was the first salsa I made that wasn’t all tomatoes, about 15 years ago 🙂 love, love, love it! I made this for lunch today and it is absolutely delicious! I used kidney beans because that’s what I had on hand. I agree that the cumin makes the whole dish. It’s like a taco salad, and I don’t miss the meaty taste because the beans and cumin mimic it well. This is delicious! I’m not a huge cilantro fan, so I only did have 1 Tbsp of it. I also used light tasting olive oil (all I had in the house) and I used probably a whole Tbsp of that as well. It’s soooo good. I made it as side for my homemade Fiesta Lime Chicken (never going to Applebees again 😛 ) with some Mexican rice. It was perfect. Great idea for the upcoming period! Thanks a bunch for the delicious salad!